AMICORUM.LIVE is a platform for the people, by the people and of the people. As we sat in a room to review what will need to go on the whitepaper, we realized how easy it was to set down our thoughts and what this platform will do for the enthusiasts all around the world. That is why we gave it a name most easy to know and remember – AMICORUM. AMICORUM (Latin word close to the meaning of Gathering of Friends) is a crowdsourced blockchain-based marketplace and peer-peer ecosystem for ticket resale of music festivals and concerts. 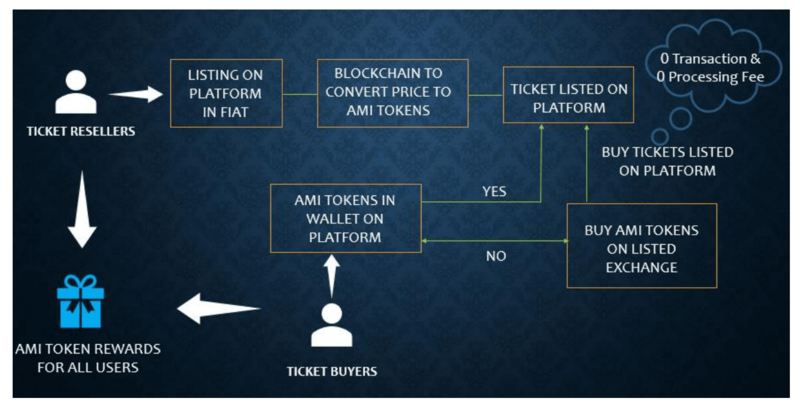 Buyer’s (Festival/Concert enthusiasts) will be able to buy tickets (that are resold) with the AMI token (the new cryptocurrency based on Ethereum blockchain) from the Sellers at 0 transaction fee and 0 processing fees. AMICORUM.LIVE will be an innovative blockchain ecosystem that will disrupt the music festival/concert ticket ecosystem and decentralize the ticket re-sale markets. Transaction Fee – Although the seller is able to sell their tickets online, the buyer still needs to pay for the ticket, platform fee and a transaction fee that is charged by their bank. The AMICORUM.LIVE platform will take away this pain from the buyers and provide a seamless experience free from any transaction fee or bank fee. The platform will be used to sell tickets and buy tickets at the cost listed. Untrusted/Counterfeit – Despite the usual warnings on the website asking buyers to only buy tickets from the box office or a reputable ticket exchange website, they still direly go straight into this problem. And even fuel it. The most usual case is when the same ticket is sold to 10-15 enthusiasts or even more. The first ticket holder to arrive, gets to view the event or attend the concert/festival and the rest have to just go back home. The problem creates a two way issue – one for the enthusiasts who was keen on attending the event and spend a lot of money and other the organizers who could have sold one more ticket to the enthusiasts. At the least, there is no one winning here. AMICORUM.LIVE will provide security for the money spent on buying these tickets and ensure a mutually profitable interaction for the parties involved. AMICORUM.LIVE will be a secure, transparent and “0” transaction/processing fee based blockchain ecosystem for the ticket re-sale industry, eliminating transaction costs, fraud and empowering ticket buyers. During the process (workflow fig below), the seller will list their ticket. Ticket prices will be denominated in fiat currency and use a market-feed oracle to calculate AMI prices at the time of purchase. The buyer will confirm the purchase of the ticket and generate a transaction or token exchange in return of the ticket. Based on Ethereum blockchain, the transaction will be confirmed after confirmations received from the network. The tokens will be sent to the seller and the tickets will be available to the buyer in their account for download and use at the event. The platform automates all business processes related to listing, sale, re-sale, token redemption, rewards and redemption of the festival or concert tickets while timely distributing the funds associated with each sale. Each transaction on the AMICORUM.LIVE will be eligible for a reward in AMI Tokens and transferred during confirmation of purchase and sale of tickets. AMI Token Rewards will be a % of the transaction value and authenticity of ticket. Blockchain is a shared, public ledger of records or transactions that is open to inspection by every participant but not subject to any form of central control. It has been described as machine for building trust. Decentralized Validation – When a transaction such as a ticket sale occurs, new data blocks describing it are added to a chain only after consensus is reached among the relevant participants on the validity of the action—for example, when the users are validated, sellers list their tickets and buyers purchase the tickets. Redundancy – As the blockchain is continuously replicated on all nodes and that too on a single network, there is no single point of failure. This means that all the transactions for ticket re-sale will be listed on the network without the fear of deletion of records. Immutable storage – In order to tamper with data on blockchain, they would have to alter not just one block in a chain but also all successive blocks and most of their replications. Hence, any attempt on duplication of tickets or trying to name the tickets to a new user are not just easy but will be practically impossible to perform. Encryption – Digital signatures based on pairs of cryptographic private and public keys enable network participants to authenticate which participant owns an asset, initiated a transaction, signed a smart contract, or registered data in the blockchain. All the listed tickets will be validated, all user authentications will be validated and all transactions amongst these users will be validated on the smart contract within the blockchain. There are various ticketing protocols that are still under development or developed that will help in our journey during the ticket re-sale. These protocols are designed to give complete control over the sale and trade of tickets between the ticket holders and buyers. Every ticket is guaranteed unique, which makes ticket fraud impossible. Blockchain technology enables easy verifiable authenticity of tickets. A smart ticket knows of itself who the owner is and automatically registers ownership changes. The cryptocurrency backbone account for value flows during the secondary ticket trade and even in-events value transfers. These Ticketing Protocols are generally open-source that delivers the global standard for ticketing. The protocol permits rights holders to define rules across the ticketing supply-chain – including promoters, venues primary / secondary agents – to which everyone must adhere. PROFILE CREATION AND IDENTITY VERIFICATION – A user creates an Identity on AMICORUM.LIVE platform, or has one created for them by integrated partner API. 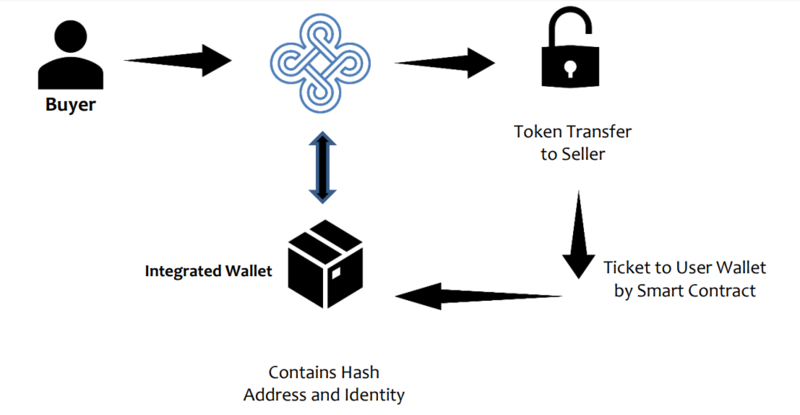 A user has a Wallet address, containing an HASH ADDRESS and part of their Identity. TICKET LISTING – A user lists their ticket (entering detailed information) and connecting their wallet address. 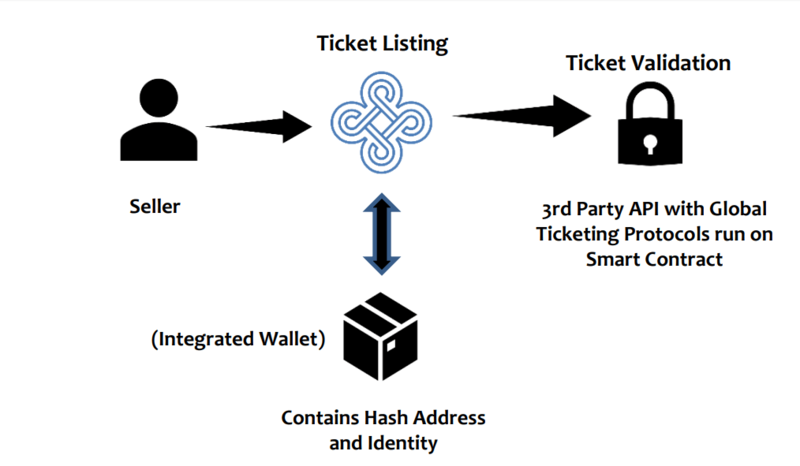 The ownership of the ticket is validated by third party API implementation on different ticketing protocols (run on Smart Contract based Ticket sellers) or they can even be using their own block explorer. TICKET PURCHASE – Another user purchases (or otherwise requests) a ticket and using OAuth connects to the AMICORUM.LIVE ticketing platform using their Identity created and validated. The re-sale ticket is sent to the wallet address via Smart Contract. The user now has enough to attend their event. They show their Wallet address (typically by QR code) to the door staff, who can verify that they are owners of the tickets and that their identity matches. The system will even allow for ticket transfer to another AMICORUM.LIVE Identity within Smart Contract. We understand blockchain technology is not everyone, so our vision for the end-users is that they don’t need technical knowledge to use the platform. We will setup the platform, build the required API, create a validation protocol for profiles and transaction for our users to experience a seamless ticketing journey.